American Abstract Expressionist painter whose brilliantly coloured canvases have been much admired for their lyric qualities. During the 1950s Frankenthaler's staining technique influenced other painters who worked with large fields of intense color. Helen Frankenthaler was born in New York City and studied with Mexican oil painter Rufino Tamayo while she was still in high school. She earned a B.A. degree in Art from Bennington College in 1949, then returned to New York City where, in 1950, she studied briefly with American artist Hans Hofmann. Influenced by the work of such artists as Arshile Gorky and Jackson Pollock, she eventually becameknown as a member of the second generation of Abstract Expressionists. In 1952, inspired by the paint-dripping techniques of American painter Jackson Pollock, a founder of the abstract expressionist movement, Frankenthaler began to pour thinned-down oil paint directly onto raw canvas that she had spread on the floor. Whereas Pollock splattered his canvases with thick layers of tangled, dripping paint, Frankenthaler applied paint in thin washes that she allowed to soak into the canvas, allowing the texture of the canvas fabric to show through. American painter Kenneth Noland soon adopted similar techniques in his color-field paintings. From 1958 to 1970 Frankenthaler was married to Robert Motherwell, another leading abstract expressionist. 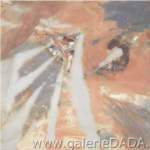 You can buy Helen Frankenthaler fine art reproduction oil paintings at Galerie Dada. Just select from the top.